VARANASI/GAYA, 13 July 2010: After taking boat rides on holy Ganges in historical cities of Allahabad and Varanasi in Uttar Pradesh the Queen’s Baton 2010 Delhi has reached Gaya in Bihar. The baton entered the Eastern state of Bihar from UP-Bihar Border, and reached the holy town of Gaya which is almost 200 kms. Large number of people gathered on both sides of the road to catch a glimpse of the baton. As the baton made its way into Bihar, it braved heavy rains and continued further. Even amidst the rains people thronged towards the relay route waiting to welcome the baton. For the first time, kids from various schools displayed tableaux to welcome the baton in their state. The first relay in Bihar was conducted in Kaimur Vihar. Here, the prominent Batonbearers were Principal Secretary, Bihar Olympic Association Mr. Mohd. Mushtak Ahmed and national athletics champions including Ms. Jyoti Kumari, Mr. Mohd. Tasleen Khan and Mr. Ramesh Prasad. Weightlifter Mr. Mohd. Sheran Khan was also one of the Batonbearers. From Varanasi, the baton started in the morning and there was a plantation drive conducted at Krishnawati boating site near Rajghat. Later, there was a welcome ceremony at the UP – Bihar border which was followed by another welcome at Khurmabad, Rohtas District. 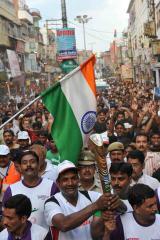 Earlier, on Day 17 of the relay, the baton witnessed a religious welcome at the ghats of Sangam city, Allahabad. 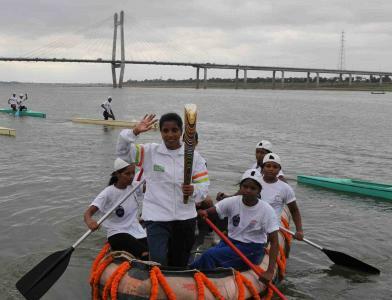 The baton was then taken for a boat ride at Saraswati Ghat. At the reception, IG – Mr. Sudesh Kr. Singh, DIG – Mr. B.B. 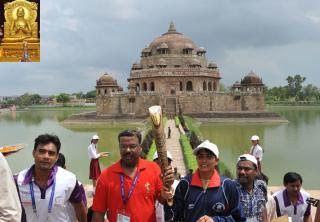 Sharma, Tourism and Cultural Secretary of Allahabad – Mr. Avnish Awasthy and Central Director Tourism and Culture – Dr. Hari Om received the Queen’s Baton Relay 2010 Delhi team. Apart from the athletes and leaders, there were artists as well who held the baton. Padmashree awardees like Ms. Girija Devi and Mr. Balwant Rai Bhatt also participated in the relay. The baton is now in Bihar’s capital Patna.